Older Jane: [Older Jane narrating] The last full moon of that Spring came a little more than a month before school let out for Summer vacation. Our town's long nightmare began that night. Published by Touch Music, Inc.
Q: Is "Silver Bullet" based on a book? Q: How many people does the werewolf kill? Q: What sort of card game was Uncle Red and Marty playing with both baseball and playing cards? I first saw this movie when I was ten years old, my uncle, a horror fanatic, showed this to me and my brother and it scared the living soul out of me. Ten years later it still remains as one of my favorite horror films of all time and I consider it one of the best of King's work. When a small town is being ravaged by horrible mutilations, townsfolks begin to think it may be a monster doing the killings. A small crippled boy comes in contact with the werewolf and confides in his older sister and uncle and they all set out on a search for the monster. What they discover will be shocking. The film is very well directed and relies a lot on tension and atmosphere and solely on the acting which is performed well by Corey Haim, Megan Follows and Garey Busey who is immensely likable and memorable as the uncle. 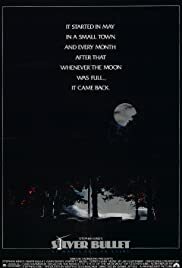 The film itself as a horror movie is excellent with a lot of sheer tension and some great horror scenes in which we never see the werewolf until the end. That's an aspect that makes this film truly horrifying and the murders are gruesome and never pulls its punches. The mysterious identity of the werewolf is shocking and it leaves us on pins and needles until the exciting end of the film. I highly suggest this among horror fans and think it's worth a look. ***half out of **** stars.